I am a newby to Xojo. I am attempting to take Text Field data inputted from a Web Page and insert this into a database with the following code which is not correct. You are doing an insert before you connect to the database. The second insert after the db connect is correct. I have removed the Insert line before the Connect but I am still not able insert the record. @Craig W Thank you for the assistance. What Error does the DB report, please? It does not Error. The DB.Connect is successful but the Insert does not seem to insert the record. I'm clearly missing something as I created the DB with the associated Table. 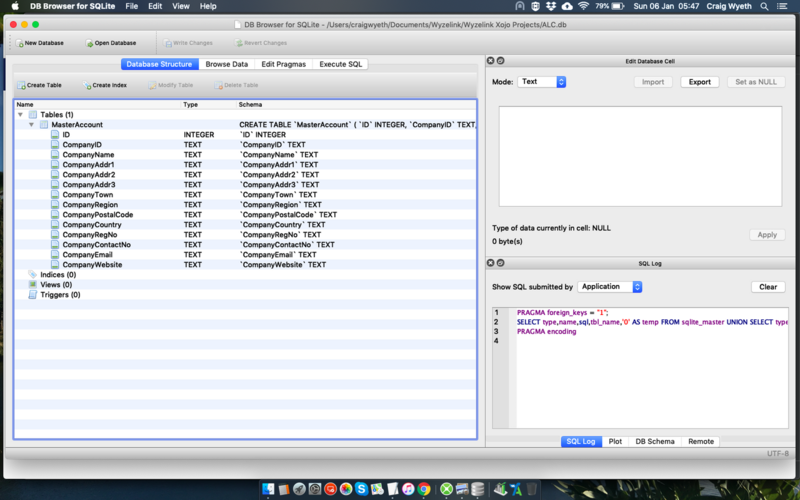 open the db in another sqlite manager such as "Datum" or so. With this you can check if your changes in the xojo-sqlite-interface are commited correctly. The IDE-inbuilt interface for sqlite isn't alway the best choice. I assume this error occurs during a Debug session. If so, is that database also in your Debug folder for that project? If so, does it have a MasterAccount table? @Ralph A I assume this error occurs during a Debug session. If so, is that database also in your Debug folder for that project? If so, does it have a MasterAccount table? I'm actually not sure if what I said above is relevant if you have the database in the IDE itself. Not sure how that works during Debug. I only use databases that are not in the IDE. not sure also the primary key named "ID" is a boolean field.... will certainly not work. you must use an integer. @Jean-YvesPochez not sure also the primary key named "ID" is a boolean field.... will certainly not work. you must use an integer. that is true, but why say cannot find MasterAccount??? I see in your picture that you have added a link to the database in the IDE. Is the link in the IDE pointing to the same location as the location that you are using to connect to the database (DBFile)? If not then the database you connect to doesn't have the table that you assume it does. Furthermore I would advise you to use SpecialFolder to get to the documents folder. Thank you for your advice and assistance. It is very much appreciated.